​AC Milan moved back into fourth place in Serie A with a comfortable 3-0 win over Cagliari on Sunday evening. Milan started well and were ahead after 13 minutes courtesy of an own-goal from Luca Ceppitelli. Alessio Cragno could only palm a Suso effort back into the danger zone and the ball bounced straight off the unfortunate Ceppitelli and into the back of the vacant net. I Rossoneri then went on to double their lead ten minutes later through Lucas Paqueta. Davide Calabria delivered a wicked cross to the back post and Paqueta was on hand to volley the ball home with consummate ease for his first goal in red and black. Both keepers were kept busy thereafter, but neither side was able to add to the scoreline before the half-time interval. Milan rode their luck on the sixty minute mark when Joao Pedro inexplicably hit the bar from close range and they capitalised on the Brazilian's wastefulness by scoring a third goal moments later. Krzysztof Piatek found the net once again, passing the ball home after a scramble in the Cagliari box. Cagliari did fashion themselves one or two half-chances in their search for a consolation goal, but Milan held strong at the back and finished the game as comfortable 3-0 winners. The race for the top four in ​Serie A is beginning to heat up, and with Atalanta, Roma and Lazio all winning, ​Milan knew that they needed nothing less than three points from this one to put them back in the driving seat. They not only won the game, but they did so in convincing style. 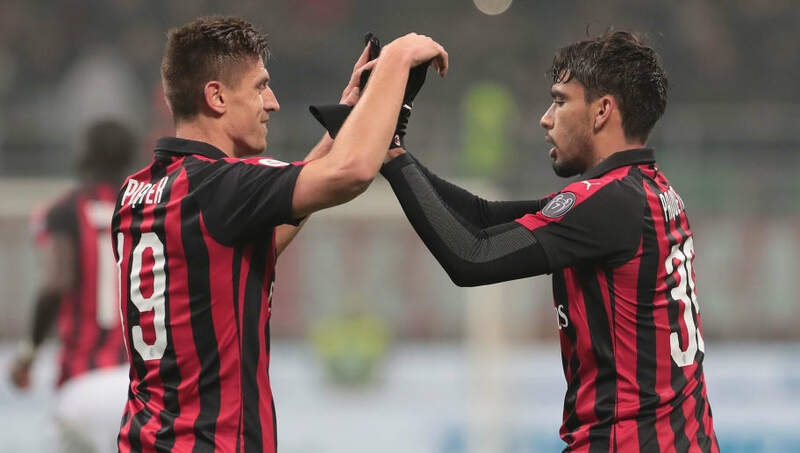 January signings Paqueta and Piatek appear to have breathed new life into I Rossoneri, adding an extra dynamic that was previously missing in the earlier stages of the season. Gennaro Gattuso's men are hitting a good run of form at just the right time and, with so many sides struggling for consistency this season, it may only take a few more wins for them to cement their spot in the Champions League places. Starting XI: Donnarumma (7); Calabria (8*), Musacchio (6), Romagnoli (7), Rodriguez (6); Kessie (7), Bakayoko (7), Paqueta (8); Suso (7), Calhanoglu (6), Piatek (7). Substitutes: Cutrone (6), Conti (6), Borini (N/A). There is still plenty of debate as to who should start at right-back for Milan, but Calabria more than justified his inclusion from the start in this one. The Italian was outstanding at both ends of the pitch, combining intelligent runs with solid positioning to great effect, and his assist for Paqueta's goal demonstrated that he is more than capable of providing a killer final ball. Calhanoglu had plenty of opportunities to bring his goal drought to an end in this one, but his shooting boots were still missing. The Turkish playmaker had an otherwise decent game, but his poor form in front of goal continues to undermine the rest of his play. Milan will now be preparing for a huge game against Atalanta on Saturday, which could have serious implications in the race for the top four.